A crowdfunding platform for scientific projects. Scientificcoin allows private investors to invest their capital in scientific projects without intermediaries. Anyone can act as an expert for a reward and engage in mining with Scientificcoin. The financing of scientific projects occurs through the conclusion of smart contracts between investors and project developers. Developers can independently create unique smart contracts, choosing from a variety of parameters and conditions and using the Scientificcoin templates. The platform automatically generates an individual contract based on ERC 20 with the SNCOIN tag. 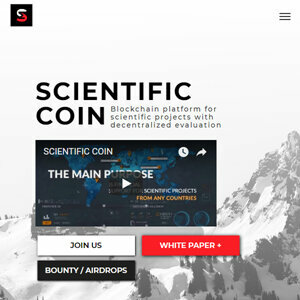 The tokens released will automatically enter the listing of exchanges – Scientificcoin’s partners – as created by the platform.